Formerly head of research and development at Noma’s Nordic Food Lab, Ben Reade returned home to Edinburgh in 2015 to open Edinburgh Food Studio – a restaurant and research hub dedicated to uncovering Scotland’s culinary history and inspiring a new future for Scottish food. Photography by James Byrne. London may still be the epicentre of British gastronomy, but there are plenty of other hotspots across the land giving the capital a run for its money. Bristol, for example, is buzzing with new food businesses these days, as is Liverpool, York and many others. 400 miles further north, Edinburgh has a thriving food scene too – one that rivals anywhere else in the country. There have always been some exceptionally talented chefs plying their trade up here – Martin Wishart has held a Michelin star for nearly twenty years at his eponymous restaurant in Leith, while the likes of Tom Kitchin and Roy Brett have long held stellar reputations for outstanding food in the heart of the city. 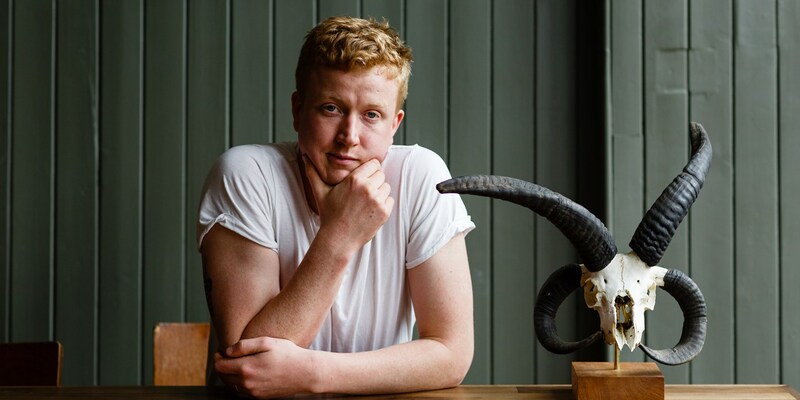 The old guard have always championed Scottish produce, but there’s a new wave of restaurateurs and chefs on the horizon who are delving deeper into Scottish food history than anyone has before. Leading the charge is husband-and-wife team Ben Reade and Sashana Souza Zanella. The pair are both graduates of the prestigious University of Gastronomic Sciences in Piedmont, where they met as fellow students. Sashana stayed on as a tutor whilst Ben departed for Copenhagen to head up research and development at Noma’s Nordic Food Lab. Three years later, they reunited in Scotland’s capital to set up Edinburgh Food Studio – a restaurant and research hub that digs deep into the substructure of Scottish food and uncovers some of the unique treasures that make up the country’s cuisine. The plan was to run the site as a restaurant and use the profits to fund research. The scope of Edinburgh Food Studio proved too much for Ben and Sashana to handle alone, however, so they turned to a series of guest chefs to look after the kitchen whilst they focused on the day-to-day business. Some serious names have graced the kitchen since then – Chef’s Table star Ana Roš, cocktail king Ryan Chetiyawardana, Douglas McMaster from Silo in Brighton and Esben Holmboe Bang from the three-Michelin-starred Maaemo in Oslo have all made the walk down Dalkeith Road to take over the kitchen at some point in the last few years. It's never been about star power, though. ‘We’ve had everyone, from folks with three stars to mates that we want to showcase because we know they're good,’ says Ben. What unites all of them is an obsession with produce and the history of food. It signalled the start of a new era at Edinburgh Food Studio – one where the business could finally start to achieve the lofty goals it set out with over three years ago. With a new team in place Ben is treading new ground when it comes to Scottish food, reconnecting people with the a huge variety of Scottish produce. Booking in for dinner is a leap of faith – no menus are published, and the food will depend entirely on what the team have sourced that day. Even the dish titles leave something to the imagination – you can work out the jist of Shetland turbot, Barra cockles, sea aster and elderflower, or girolles, meadowsweet and brown butter, but there’s no way to know the reality of the dish until it arrives in front of you. The emphasis is on superficial simplicity, but with incredible complexity underneath. A dish of ceps with Cacklebean eggs turns out to be scrambled eggs with mushrooms, but the processes underneath are extraordinary – the eggs are cooked at very low heat for half an hour, whilst the mushrooms are sweated down in vinegar to resemble something like a mushroom butter. This is where Ben’s ‘nerdy stuff’ (as he calls it) and James’ produce-led expertise come together in perfect harmony. The research hub, meanwhile, has delved into all sorts of topics – from investigation into the history and culture of sheep in Scotland to a sensory analysis of Scottish dairy desserts. Edinburgh Food Studio has built connections with other food research centres across Europe, and invites students from overseas to come and study at the centre each year – the aforementioned dairy study for example, was conducted by a student from the Basque Culinary Centre, and Ben has just welcomed a student from the Bath Culinary Centre who is putting together a study on traditional Scottish baking. Often, these studies directly inform what James does in the restaurant – the sheep study, for example, led to a number of mutton dishes arriving in the restaurant that explored the different flavour profiles of different sheep breeds. As for Ben and Sashana, the evolution has given them more time to focus on the things they want to. ‘I’ve been sidelined onto janitorial tasks,’ Ben jokes. ‘I fix the dishwasher, I shout at the phone company, that sort of thing.’ Between the two of them, the discovery of Scotland’s culinary past is in good hands.